This procession of identically dressed foot soldiers seems to advance with military precision. 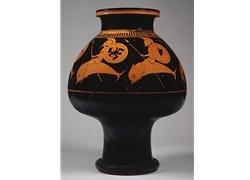 A number of other dolphin-riding hoplites appear on vases of this period. All are accompanied by a flute player, suggesting that this scene illustrates a dramatic chorus, probably from a contemporary play. The six dolphins would have seemed to leap and dive as the psykter bobbed in the ice water inside a large krater.